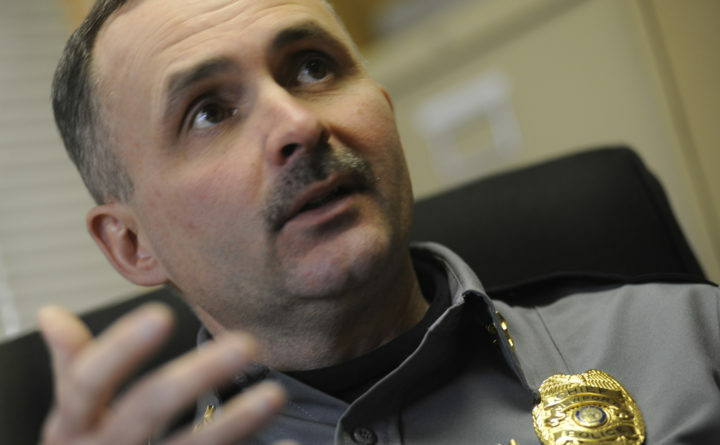 The Newport police chief is asking area residents whose children will attend the new combined Nokomis high school and middle school this fall to attend a school board meeting Tuesday to discuss reinstating the position of school resource officer. Chief Leonard Macdaid urged parents and grandparents concerned about school safety to attend the Regional School Unit 19 school board meeting at 6:30 p.m. in the Nokomis Regional High School library. RSU 19 comprises Corinna, Dixmont, Etna, Hartland, Newport, Palmyra, Plymouth and St. Albans. The student body at the $53 million combined school will grow from 900 to 1,600. The $59,000 annual cost of the resource officer, which includes salary, benefits and a vehicle, would be divided between the school and the police department, Macdaid said. RSU 19 would pay two-thirds of the cost with the Newport Police Department paying the remainder, based on the number of months school is in session. The high school has not had a school resource officer for the past two years, Macdaid said. He cited an FBI seminar held last summer that discussed trends in school shootings and their impact as one of the reasons the high school needs a school resource officer. The National Association of School Resource Office estimated last year that there were between 14,000 and 20,000 school resource officers in about 30 percent of the country’s schools, NPR reported. Those numbers began to grow after the deadly Columbine High School shooting in Colorado in 1999. Marc Schindler, head of the Justice Policy Institute told NPR that there is no evidence to show that hiring school resource officers results in safer schools. Having a resource officer on duty, Schindler said, may cause unintended consequences for students, including higher rates of suspensions, expulsions and arrests that funnel youth into the criminal justice system.